It was a long, dusty and quite frankly dangerous Moroccan journey to the edge of the Sahara desert. The day began with a 5:40am pick up and a warm welcome from our guide, followed by a cheerful declaration that we would now be driving for four hours straight without a break in order to hurry through the Atlas Mountains to avoid the explosives and catch the sunrise – he said it as cheerfully as you would wish someone a merry Christmas. OK. I’m getting visions of dynamite blasts going off in the High Atlas Mountains as we snake through those wonderfully narrow roads with little or no barriers between the edges and the deathly drops….oh yes, and of course watching the beautiful sunrise, mustn’t forget that bit!!! Welcome to Morocco, I thought. You should see some of the narrow Atlas Mountain roads with giant rocks balancing off the edges of steep mountain sides when you look up, ready to roll down at any moment, not to mention the drops off the ‘barrier-free’ edges as high as skyscrapers when you look down (I’ll talk about this more in another post). Turns out there’s a lot of construction work going on in the Atlas Mountains to make the roads wider. Explosives are used to blast through the mountain rocks, and there was plenty of visible evidence as we drove along. 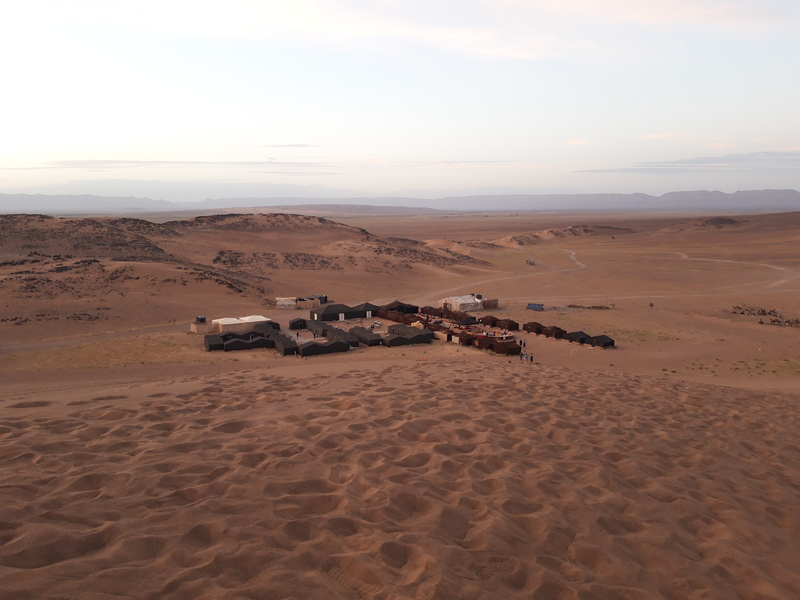 After a 5:40am pick up, it was 6.30pm by the time we got to the edge of the Sahara and mounted our caravan of camels (around 30 strong) for the onward journey to camp. For those who didn’t want to brave the camel commute, there was a jeep option – only one person opted for this. A jeep took all our heavy luggage to the camp while we rode on. A bumpy ride to say the least, it takes a while to get used to it. What struck me the most was just how peaceful it was as we rode down to camp. The mountains, sandy scenery and warm sunset against our caravan of camels was quite spectacular. Our nice Saharan guides will also want money from you when you get off your camel. Speaking of disembarkment – this was the scariest part of the camel ride – good gosh it feels like you’re going to slide down it’s neck and hit the ground while your stomach does a cartwheel. Whist seated, the camels seem to speak to each other – I’d love to know what they talk about! There was one very rebellious and feisty camel in the caravan who seemed to refuse to do anything it was asked; it wouldn’t sit, and then when it sat it wouldn’t stand and protested loudly in camel language whilst twisting and turning – trying to get away….making a bid for freedom perhaps. Note to self – I don’t think I want to mess with an angry camel. Anyway, to my horror – the Saharan guides wanted to put me on this camel for the morning ride back to our coach – the camel that (given half the chance) looked like it would probably run off into the Sahara desert with me, never to be seen again – unless it threw me off it’s back first. Horror, fear, protest, stunned silence….I can’t tell you how many different emotions went through me in the space of ten seconds, but for some crazy reason I agreed to get on that camel. It took two men to hold it down while I climbed on. I actually felt sorry for this camel, maybe s/he was tired, didn’t get much sleep that night (due to the snoring in the tents), or just wasn’t in the mood – fed up of doing the same old journey. The guides told me I was the best match for this camel because I was the lightest in weight from the group. They must have been right because once I was onboard and we got moving, my camel seemed happy as Larry, bumping along. We enjoyed the sunrise as we rode (aside from the odd bit of camel chatter), and that lovely peaceful air. When we got to the end of the journey the camel started kicking off again though…..refused to sit down….. but we got there in the end. Again, the man leading your caravan of camels will want a tip and he won’t be shy about it (just saying). In fact, Moroccans don’t seem shy about asking for money, full stop. Stiff upper lip – not a chance. What’s that saying again ‘if you don’t ask, you don’t get’ . Berber locals came out to give us a traditional performance of dance and song, while we sipped freshly poured Moroccan tea and munched on Moroccan biscuits and nuts. Climbing those deep powdery dunes is a lot harder than it looks, and a lot more fun running down them , as long as you don’t fall! All the toilets, sinks, showers were in a separate enclosure to the sleeping tents. I won’t pretend it was anything fancy, but for one night I think you’d manage. Tip: bring baby wipes and some loo roll (then you know nobody else touched it or dropped it on the floor – as it’s not in a dispenser type thing #paranoid). Tip: bring a torch or use the one on your phone if you have enough charge – and bring a portable charger just in case. The tents have a super bright electric light, but if you need to put the light on in the middle of the night you might wake up your fellow tent companions. The same applies to the tent next door to yours if you cough or sneeze – seriously. Dinner was served in a large rug covered tent – shoes had to be removed before entering, given the amount of sand we’d probably gathered whilst up in the dunes just before we ate. Three courses as usual, plus lots of that lovely fresh Moroccan bread. Before bedtime we were treated to more entertainment from our Berber hosts, a fabulous campfire, music and singing. All those room make over programmes have been getting it wrong! Where do I start, the beds were huge but rock hard and so were the pillows – unless you’ve booked a luxury Sahara trip, don’t expect too much. Obviously there are no walls but the tents are literally tent to tent – divided by a curtain, so you can hear everything that’s happening in your neighbouring tents with zero sound proofing. One of our group said it took her a long time to get to sleep because someone in the tent next to hers was snoring like an animal. Me on the other hand, I was out like a light, and slept through three of my six alarms the next morning 😆…..must have been all that dune climbing and camel riding…takes it out of you! I still managed to catch the sunrise, so no harm done. When we arrived, the tents were very warm inside but they don’t retain much of the day’s heat (March heat). By nightfall they’re a bit chilly so bring something warm to sleep in – layers. I wore about four layers and used a large thick scarf as an extra blanket (I’m one of those cold types lol). There’s a deep calm, peaceful mood in the dessert, a spiritual vibe – you could say, especially when the sun is setting and rising, the skies are a work of art against the vast landscape. The camel ride back in the morning was easier than the first one but good grief you will ache the next day, not helped by those rock hard beds. This was the last picture I took before I got on the coach and it was as if a dazzling bright light was shining from looking at the picture – but at the time everything seemed normal. I haven’t adjusted the picture at all – no filters, brightening, contrast – nothing!! Nice pictures and interesting as well as informative information! liked it a lot.